Napco Composite Packaging Technology (COMPACT), Dammam-based polyethylene (PE) films manufacturer and converter, introduces a new visually-appealing website focusing on customer needs. COMPACT’s revamped website offers tools for visitors to search for desired products according to preferences and specifications, request for quotations (RFQs), as well as submit inquiries. Interested parties can engage in online live chat, and contact product experts to gather more product-based information. The website provides in-depth information about the manufacturer’s wide range of mono-layer, laminated, and coated film structures serving the dairy, food and beverage, paramedical and pharmaceutical, industrial, as well as personal and home care sectors. In addition, visitors can download COMPACT’s corporate fact sheet and export sales map. The website provides detailed description about the composite film manufacturer’s vision and mission, philosophy, manufacturing plant, quality policies, and exports in the ‘About Us’ section. Visitors can develop and explore new business relationships with COMPACT in the ‘Join Our Team’ and ‘Become a Supplier’ sections, as well as access company news and events in the ‘News’ section. 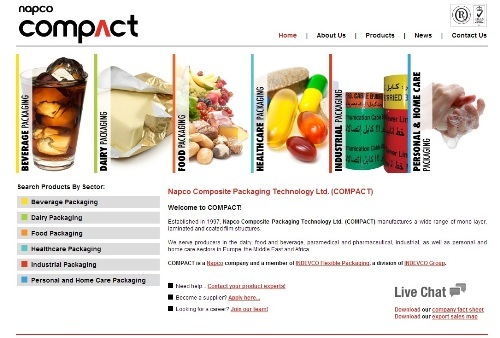 Established in 1993, Napco Composite Packaging Technology Ltd. (COMPACT) manufactures a wide range of mono-layer, laminated and coated film structures for the food and beverage, industrial, pharmaceutical, paramedical, personal and home care sectors across Europe, the Middle East and Africa. With automated color-matching and roto printing, COMPACT enhances composite film packaging products. COMPACT is a Napco company and a member of INDEVCO Flexible Packaging, a division of the multinational INDEVCO Group. OUTBOUND Will Shift to INDEVCO News Network!